Rolling into Texas, Route 66 (as in the last half of Oklahoma) runs alongside I-40 for miles and miles. There are amazing amounts of roadbed all within eyeshot of I-40, all deserted. Why are there not more folks taking the slow lane? If those "40ers" only knew what they were missing! We stopped into the U Drop Inn in Shamrock and I got a few pics there. Well, we didn't actually stop "in", as they were closed, but it was good to see the old gal just the same. The town of Shamrock is just too quiet. Don't ask me how, but we get lost in Amarillo and miss the Big Texan AND the Cadillac Ranch! We have to be sure to hit them on the way back east, along with the Devil's Rope Museum. It started getting late, so we decided to find a motel. As with the rest of our trip, we have no reservations. I find it much more relaxing to just hit the road and quit when you get tired, rather than rushing to a motel to make the cut off reservation time. We decide to check a few motels near the end of Texas, but the bulletproof glass at the lobby desks scare us off. So, we hit the Interstate for Tucumcari. 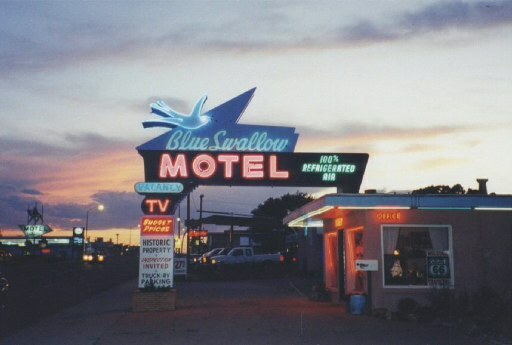 I call the Blue Swallow, and they have rooms available! I have mixed emotions driving the Interstate after running 66 for 98 percent of the time from Illinois. But these feelings pass when we roll into the parking lot of the magnificent Blue Swallow Motel, now under the ownership of Dale and Hilda Bakke. They have given the Blue Swallow a first class restoration. This place is just fantastic. Sparkling clean rooms, immaculate grounds, and prices just too reasonable! The pride they have in this place shows. A night at the Blue Swallow is not to be missed! Yow! What a day! Dad and I have been on the road close to 15 hours today. We left Chandler Oklahoma and rolled all the way to Tucumcari New Mexico! I am really looking forward to seeing New Mexico in the daylight. Tomorrow, I'd like to get to the Wigwam in Holbrook. Don't know if we'll make that though, there is just too much to see! I've been on the road four days now, but it seems like we left yesterday. Time flies when you're having fun. Fast! We left Tucumcari kinda late today. Actually, we got up early, but spent a good part of an hour taking pictures and video of the Blue Swallow and talking to the Bakke's. They are still restoring the place, so call or eMail early for your reservations! We had a good breakfast at a place called Dean's in town, Just $6.54. For the both of us! We left Tucumcari and just before Montoya (pg. 39, col. 1 of Bob Moore's book) at 9.8 miles, we find a wonderful old Spanish cemetery, dating back to before the time 66 went by. Stop and look at the old stones, and the intricate work that went into these handmade stones. Got lost on a dirt segment after Newkirk, we took a road we though was correct, but we were wrong. I saw a "dead end road" sign that we missed, that was probably it. We hopped on the Interstate for a while here, with short stops at Santa Rosa and Cline's Corner. We got off by Moriarity and found an operating Whiting Brothers service station! The old signs were still there, but I was thrown by this sight, I remember reading that they were all closed. Must be an independent dealer. We jumped back on I-40 and bypassed Albuquerque to save some time. We got back on the old road at Laguna and drove through the Indian Reservation. Very, very depressing looking at the housing in the area. Dad mentions that much of the land seems rocky and must be good for not a whole heck of a lot. If you decide to run I-40 instead of getting off the road at Laguna, run the short stretch near Mesita. It is a great twisty-turny section that winds in and around, instead of over, the beautiful terrain. Moving West, we found some great Whiting Brothers signs still beckoning travelers off of the Interstate. The station and motel are in ruins, but it still provides for some really great photo opportunities. We hit massive amounts of rain thru Grants. So we ran the road as best as we could. Actually, we probably made great time, and I couldn't stop every five minutes to take a picture! After crossing the Continental Divide, we ended our day in Gallup. We stayed at a chain motel near the end of town, as the downtown area of people walking the street and bars on every corner didn't appeal to us.